You know things have really changed when Economists start revising their statements more than the data. What’s going on in the global economy has quickly reached a critical stage. This represents a big shift in expectations, a really big one, especially in the mainstream where the words “strong” and “boom” couldn’t have been used any more than they were. If you read nothing other than Bloomberg, it’s as if some alien force has descended upon the world and completely spun it around the other way. The cyclical upswing that took hold of the global economy in mid-2017 was never going to last. Even so, the extent of the slowdown since late last year has surprised many economists, including us. The probabilities have all changed, only not as much as you might have expected. 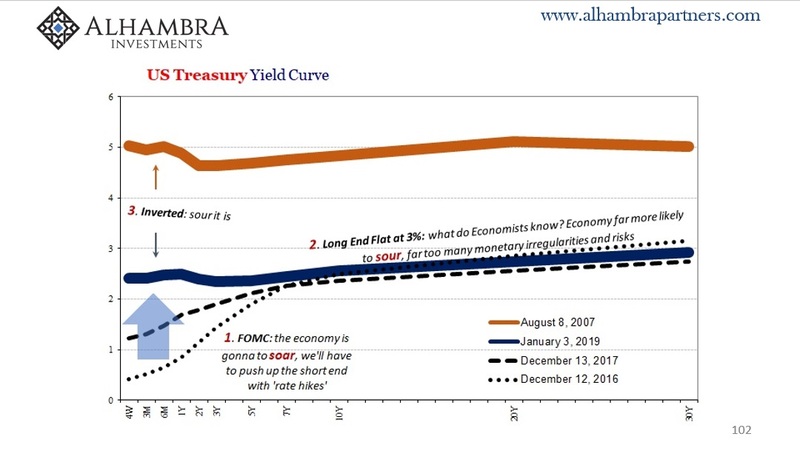 Bond curves around the world have been uniformly skeptical about this last upturn; more likely to sour than soar. As more and more data comes in from key places around the world, sour appears to have been the correct interpretation. Ignore the flattening curves, they said, just term premiums. Germany is one such bellwether. Whether you are partial to Korean nukes, trade war rhetoric and uncertainty, even the inflationary scenario formerly of Draghi and Powell, “whatever” it was it smacked the German goods economy first and hardest. Since, at the margins, this particular piece derives much of its strength from selling stuff to the rest of the world, if suddenly Germany’s factories are scaling back we know what that says about the true state of the global economy.